Guest blog post by Nicole Slabonik. She and her mom are currently raising their fifth dog for Susquehanna Service Dogs.They're walking in the Highmark Walk for a Healthy Community to support SSD. Want to join them and #WalkforSSD? Sign up for the walk! 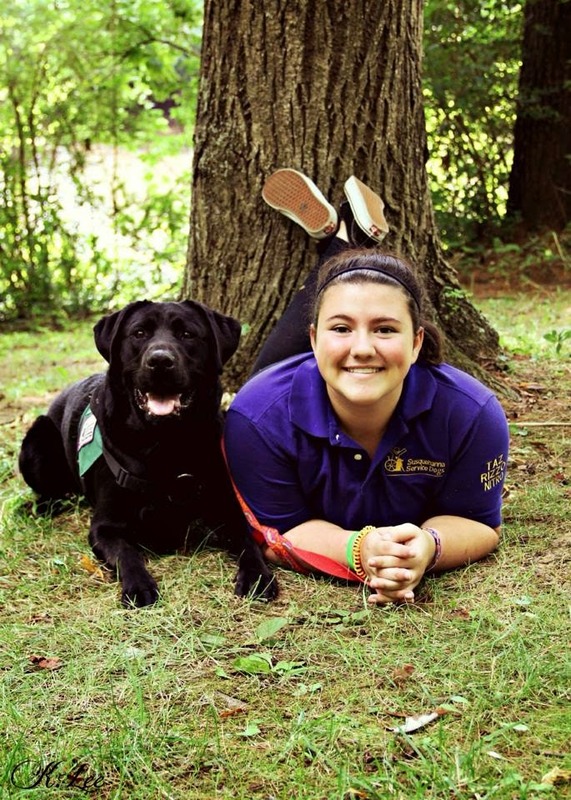 Hello everyone, I am Nicole Slabonik and I have been a puppy raiser for Susquehanna Service Dogs for about five years now. I started raising service dogs when I was 10, but a few months before that my mom and I did puppy sitting for raisers. SSD is one of the most amazing programs to be a part of. Many times you might hear some of us say we are a big family. Since my mom and I started in 2010, we have raised 5 dogs. We have had Discharged SSD Tanzanite, Discharged SSD Rizzo the Rat, SSD Nitrogen, Discharged SSD Drizzle, and currently we are raising SSD Elwood. I usually get asked in public why I raise these dogs or how am I able to give a dog up after having them for about two years. Since I’ve been with SSD for 5 years now, the questions are easier to answer. I raise service dogs because of the partners and the puppy raisers I get to meet along the way. Before my mom and I started raising service dogs for SSD, we helped out with team training. We were hesitant about becoming puppy raisers, but after we spent our time volunteering, there was no more hesitation about whether we wanted to become raisers. Being able to spend a week watching partners interact with their service dogs and work together was so amazing to experience. We were certain we could give these dogs up because we knew these service dogs would help someone in need. On May 16, we’re going to participate in an event called the Highmark Walk for a Healthy Community to help support and raise money for SSD. My mom and I walk to help create a better life for the adults and children with disabilities. I also walk to help support my family members with disabilities like my cousin who has autism and is partially deaf in one ear, or my cousin who has Down syndrome, and also my grandmother who passed away with multiple sclerosis and made her way around in a wheelchair. SSD raises, trains, and places these service dogs to help children and adults who have physical disabilities, mental illness, autism, hearing loss, and we also help military veterans. Training one of these dogs takes about two years to fully train, and they are all trained specifically for their partners needs throughout advanced training. Some people never really realize this until they see a team in action, but these dogs are truly amazing and can completely change someone’s life in the blink of an eye. Guest blog post by Stacy Tarkowski. 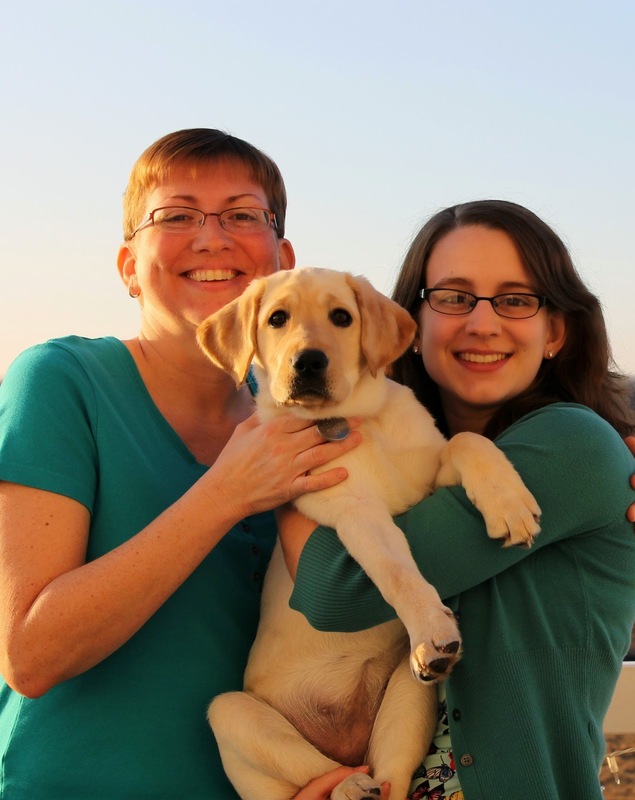 Stacy and her family are puppy raisers, raising SSD Ellie. They’re walking in the Highmark Walk for a Healthy Community to support Susquehanna Service Dogs. Want to join them and #WalkforSSD, too? Sign up online to join the walk. Though I was born and raised in Central PA, I've been out of the region for almost 20 years. Shortly after I returned home to PA, I was introduced to Susquehanna Service Dogs through a friend who'd gone to work with the organization. I've always been an avid animal lover and, in the background of my mind, I was aware of the existence of service animals but had never given much thought to them before learning about SSD. The more I learned about this organization, the more I began to admire what it does. Susquehanna Service Dogs asks volunteers to raise their puppies and attend classes to train the pups, teaching them loose-leash walking, several basic cues and good house manners. At around 18 months old, the dogs leave their raisers during the week and attend advanced training where they work one-on- one with professional trainers to prepare for life as working dogs. Once they're ready, the dogs are placed in many different environments: providing confidence to a child with autism, supporting a soldier suffering from PTSD, or simply providing companionship to someone in need. The brilliance of these animals - combined with the dedication and support of the SSD community - make Susquehanna Service Dogs an amazing organization and one I am proud to volunteer for. My family started puppy sitting for SSD after we lost our beloved family dog to bone cancer. Through much pleading and convincing from my 17-year-old daughter, Emma, we recently decided to become puppy raisers. Emma is a high school senior, deciding whether to go to school for veterinary sciences and one day open her own clinic or going to school for animal psychology and working somewhere fun like SeaWorld, training their dolphins and whales. In either journey, volunteer opportunities like raising a service dog are great experiences for her - and for us! Emma and I are raising SSD Ellie (with very much support from my husband and 14-year-old son), a female yellow lab born in December 2014. Ellie is full of energy and takes much of ours. But the energy she brings into our house is positive, happy energy and she has taught us so much as we work on teaching her to become a working dog. It's tough work, but it's rewarding work. I love seeing how excited Emma gets when SSD Ellie has mastered a cue! Few things I've done as a parent have provided as much of a lesson in responsibility and accountability as raising this puppy. I'm very grateful Emma convinced us to do it because it's deeply rewarding. That's why I'm walking for Susquehanna Service Dogs in the upcoming Highmark Walk. I'm walking because my family believes in SSD and what they do for others. I'm walking because we're raising SSD Ellie and she's teaching us as much as we're teaching her. Now, if you'll excuse me, SSD Ellie and I still have to work on her loose-leash walking. The Highmark walk will be here soon! Eva’s First Litter Has Arrived! Do you remember SSD Eva, the dog who joined Susquehanna Service Dogs from Guide Dogs Queensland in Australia? She just had her first litter of puppies! Meet the F Litter: Forte, Freya, Fitz, Frankie, and Finnick! These five puppies were born on Saturday, February 21, and they’re growing quickly. You can watch them on the puppy cam. The F puppies have a big future ahead of them. Eva and her puppies are part of the Assistance Dogs International’s North America Breeding Cooperative (ABC). ABC is a group of service dog organizations throughout North America that are dedicated to producing quality service dogs. The co-op helps strengthen the genetic lines of our service dogs so the dogs we raise and train are the ones who are best suited to service dog work. Half of Eva’s puppies will be raised here at SSD and the others will go to other ABC members to start their service dog journey. When Eva first joined us a little over a year ago, some of you donated $3,455 to support Eva and her future service dogs. Thank you to everyone who contributed! Would you like to continue to support Forte, Freya, Fitz, Frankie, and Finnick as they grow into service dogs? You can make a donation online. We’re looking forward to watching these five puppies grow into service dogs and change lives!